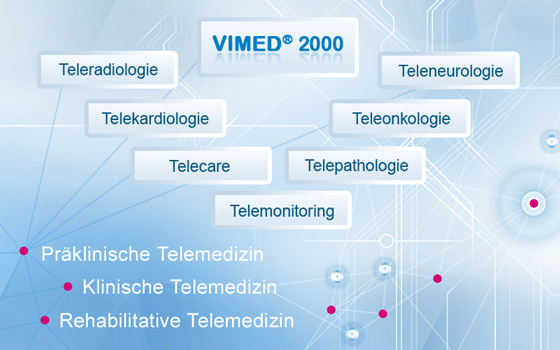 In addition to the various VIMED® telemedicine systems by MEYTEC there exists a comprehensive range of diverse efficient specialist solutions for the transfer, visualization, diagnostic findings or storage of medical audio, video and image data in hospital networks via intranet or internet. MEYTEC’s telemedicine solutions are professional tailor-made applications for communication in the medical field, especially where the audio-video and image communication are essential. The VIMED® telemedicine solutions may be combined with, and integrated in each other. Telemedicine solutions made by MEYTEC include several application areas of telemedicine from teleradiology to telerehabilitation. MEYTEC offers user-friendly telemedical solutions for medical professionals, e. g. in telediagnostic, telecooperation, teleconsultation, teleconference, telemonitoring etc.